Judging from this 1976 card, you’d have to think that Jesus Alou led a charmed life. The back showed many years in the major leagues, including some at the beginning of his career with the Giants and in the company of his two brothers, Felipe and Matty. More recently, after a stint with the Astros, he’d returned to the Bay Area to collect two World Series championship rings as a member of the Oakland A’s. In early 1975, the A’s decided they no longer needed his services as a part-time right-handed singles hitter, but the Mets swooped in and signed him. He seems content, even happy, to be in a Mets uniform. This card, in fact, has always stood out to me for the placid, merry look on Jesus’ face. I liked it as a kid, in part because it contrasted so strikingly with the Jesus Alou card from the previous season, which showed in extreme close up a balding, suffering man in the midst of turmoil. By contrast, this photo suggests that in the next moment Jesus Alou will stroll off to partake of one or another of life’s many little pleasures, maybe a pregame snack or some cartoons or a nap or a relaxed, laughing conversation with some grounds crew guys. So what can we take from this card in terms of predicting the fortunes of the 2011 Mets? To be thorough on the matter, it should be noted there are some elements of the card that don’t bode well for this year’s Mets, such as Jesus Alou’s tepid efforts for the 1975 edition of the squad as shown on the back of the card: just 3 extra base hits (all doubles) in 102 at-bats, part of a relatively empty .265 batting average, and you could also mix in the knowledge that the year this card came out, Jesus Alou was no longer on the Mets, or anywhere else in the majors, and that he couldn’t be found anywhere in the league the following year, either. There are signs, in other words, that things might not work out for the 2011 Mets, and these cloud the crystal ball that is this 1976 Jesus Alou card, but it also seems relevant that Jesus Alou, like his more famous namesake, made an improbable return from what seemed to be a permanent oblivion: two years on from seeming to appear on his last baseball card, he resurfaced with spectacular visual flourish in the rainbow uniform of the Houston Astros, and in his quietly miraculous resurrection season of 1978 he batted .324, a career high. 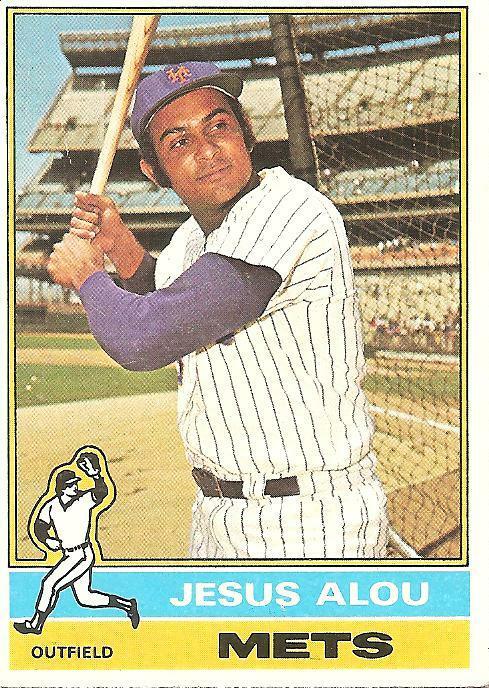 It seems clear, with all this evidence of the charmed life of Jesus Alou, not least of which being Jesus Alou’s capability on this 1976 card to calmly rejoice in his own good fortune even as he is on the brink of a major league exile of a length from which few, if any, have ever returned. So have the faith of Jesus and enjoy, Mets fans. Your 2011 Mets will lead a charmed life. You are currently browsing the archives for the Jesus Alou category.